"This is a wonderful and very easy recipe to throw in the slow cooker on those really busy days. It can be increased for a large group or downsized for 2 people. It reminds me of summers in Texas." Stir barbeque sauce, water, Worcestershire sauce, and liquid smoke together in the bottom of a slow cooker. 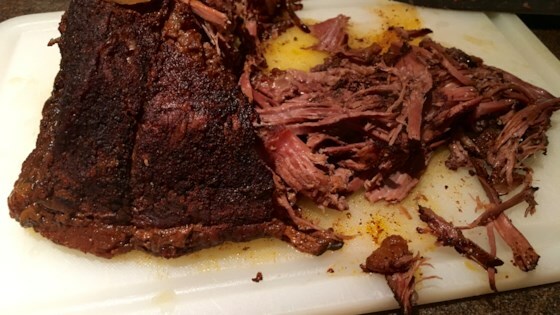 Lay brisket into the sauce mixture. Arrange onions atop the brisket. MUCH TOO SALTY. I followed the recipe exactly as it was written. Cut the spices at least in half or plan on a SUPER SALTY meal!